It's 'thank u, next' for these celebs! Breakup rumors began to surface when Kiana Valenciano tweeted in August: "Can I just say, I'm such a hopeless romantic, like [let me] build my career, yeah, but if I don't have someone to share it with, like.......what's the point?" In September, PEP.ph published an article where Sam Concepcion confirmed their breakup. He was also asked if the decision to end the relationship was mutual. “Hindi ko alam kung paano sasagutin yung question na 'yon kasi parang I'm looking for an answer myself. Hindi ko mabibigyan ng truth; hindi ko pa alam, e. I'm taking it one day at a time." In March this year, Sam Milby acknowledged on Tonight With Boy Abunda that he and his girlfriend, TV host and blogger Mari Jasmine, have broken up. The couple first went public in 2016. Currently, Mari Jasmine is dating director Samantha Lee. Although they never officially confirmed their relationship (the two even attended the 2017 Star Magic Ball together), Sofia Andres shared that she and Diego Loyzaga "parted ways" during an interview with PUSH in May. Sofia said that they were civil and added, "Nung after po nung Pusong Ligaw kasi… there are times na okay po kami, there are times na nagka-clash talaga. E siguro po, iba po kasi yung wavelength namin, e. Iba rin yung lifestyle niya at yung lifestyle ko." During an interview on Tonight With Boy Abunda in September, when Diego was asked "Maliban sa mama mo, sino ang babaeng pinaka minahal mo?" Diego's ready answer was, "Sofia." Awww. The two have ~reportedly~ broken up, and these rumors are fueled by the fact that Julie Anne San Jose doesn't follow Benjamin Alves on Instagram anymore. In November, Julie also posted a photo of her new short haircut, along with the caption "thank u, next," a direct reference to the post-breakup/self-love Ariana Grande anthem. Janella Salvador made headlines in October after coming out with physical abuse allegations towards love team partner and rumored boyfriend Elmo Magalona. 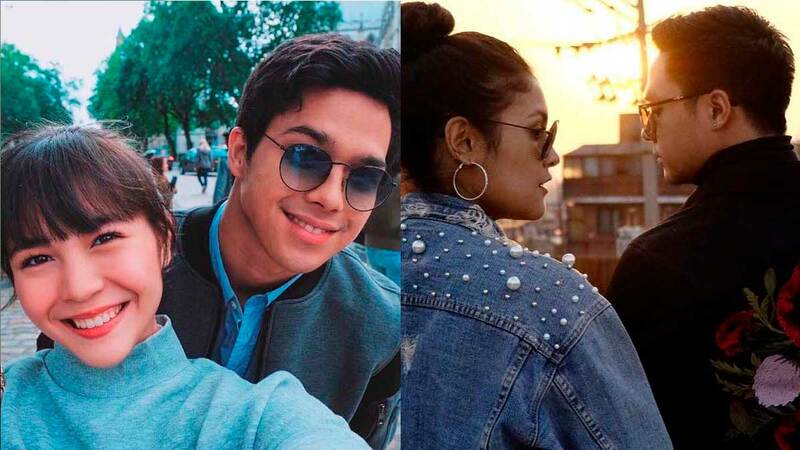 Janella has since quoted lines from "thank u, next," performed with Elmo during a show in Canada, and has been spotted out on a "date" with fellow celeb Marco Gumabao. In a series of now-deleted social media posts in July, actress Barbie Imperial shared alarming photos of her body with bruises. She also posted a tweet saying, "Girls, just because mahal niyo ang isang tao pero sinasaktan kayo physically, hindi pwedeng patuloy 'yan. HINDI TAMA MANAKIT NG BABAE PHYSICALLY." The internet has been connecting this incident to her then-boyfriend Paul Salas, who has remained silent about the issue. During an interview with PEP, Paul shared that the reason why they're not in a relationship now is because "hindi lang kami nag-work."